I am not claiming this has not been done before. 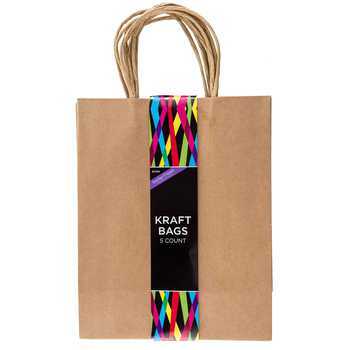 That is how to make a gift bag into a work of art. What I will say though, is I put a different twist on mine. I didn’t have a pretty bag already on hand to simply frame. That looks good too. 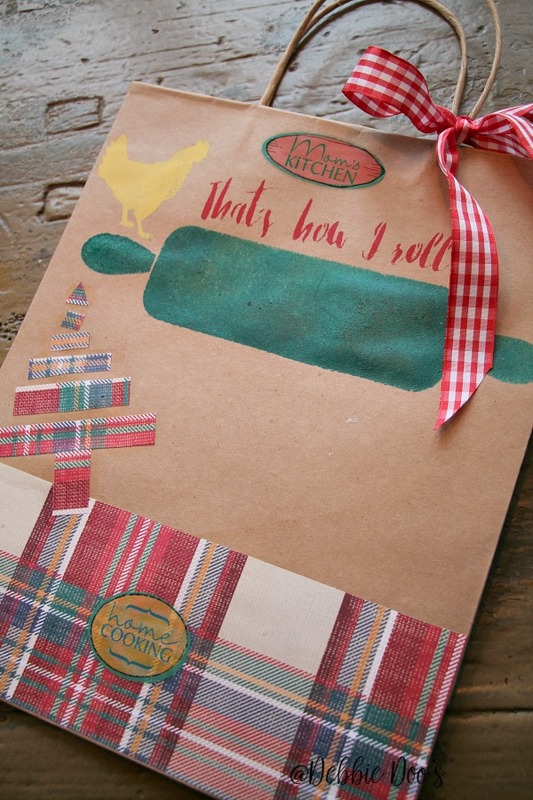 I have seen it done with dollar tree gift bags and it is quite adorable. I created my own art. Now these bags will be gifted, of course with a gift inside. I won’t leave them empty. That would be funny though wouldn’t it? Here’s your bag Merry Christmas! I will however, be sure to tell the recipient of my little master plan and how they are getting a bonus gift. 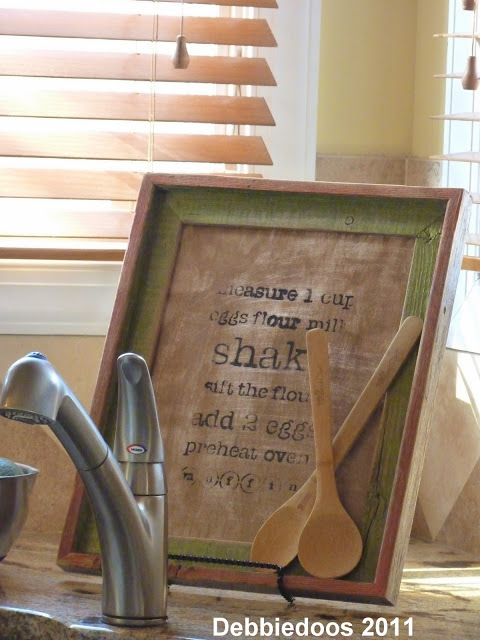 The bonus gift is to simply cut the bag along the seams and then frame the art in an 8 x 10 frame. Perfect! It all started with these simple brown gift bags. They came in a 5 count at Hobby Lobby for $5.99. Use a 40% off coupon and you are paying next to nothing. These bags are approx. 8×10 or slightly larger.They are extremely thick and probably the best quality bag I have come across in a long time. My creativity was sparked. Back in the day I actually stenciled on paper and made this kitchen art. Not only was this my very first craft stencil job I shared on my blog, it wound up being a highlight in a magazine feature. Country Woman featured our entire kitchen, and this cutie was in it. I knew when I saw these bags exactly what I wanted to do. 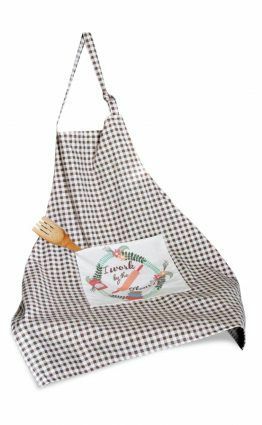 You see- a few gals are getting aprons from me this holiday season. Naturally, they would. 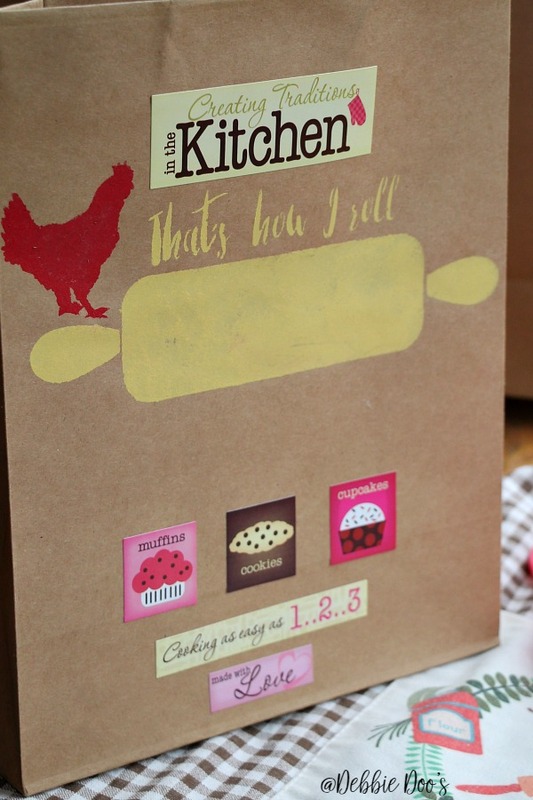 I used my That’s how I roll stencil , and some card stock stickers. I love crafting with stickers. I use stickers for a few diy ornaments in past years. My glass owl ornaments, and diy burlap ornaments. 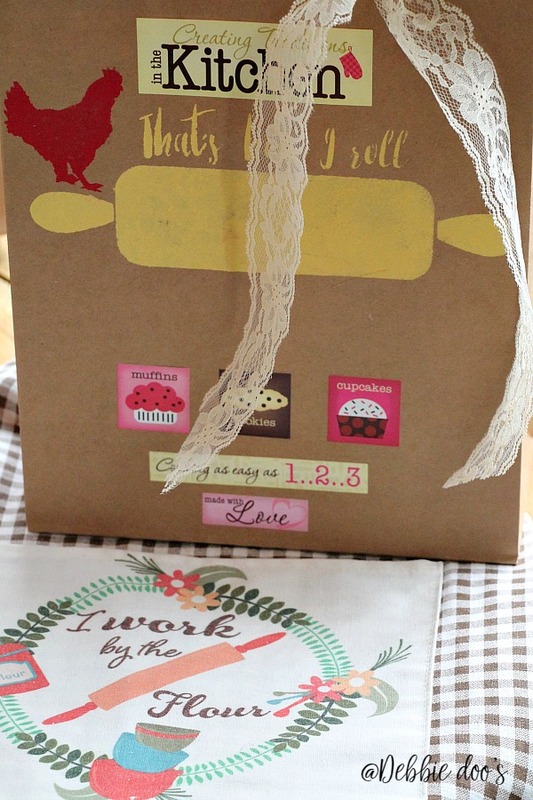 My cute apron paired with a cupcake silicone mold will make a cute gift. Then the bonus is the bag in which they can cut and frame in an 8×10. Pretty nifty huh? I went on to make some more because I was having so much fun. I used scrap paper on this one and made a little tree too. I used mod podge to adhere the paper. The stickers were all found in the scrap book section of Hobby lobby. It’s quite an overwhelming section that I love, even though I don’t scrap book. So many cute stickers these days. This bag will be filled with goodies and treats. 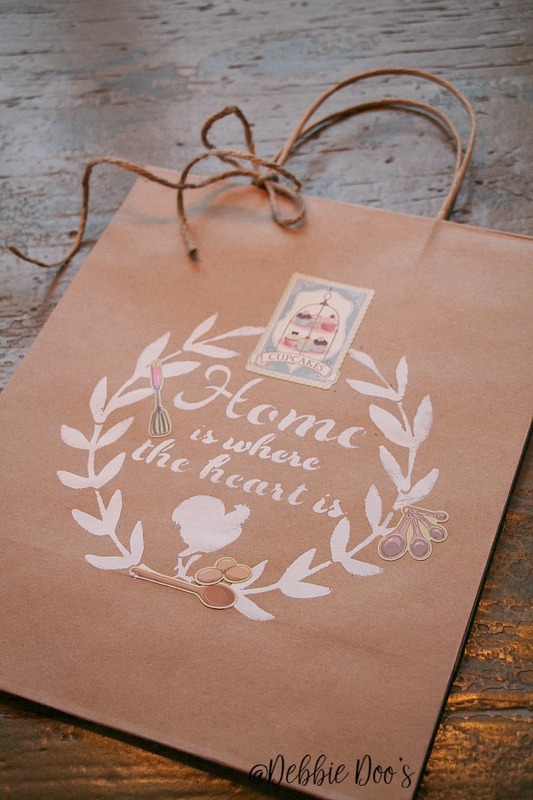 I used my Home is where the heart is stencil and some cute patisserie stickers. I did not stencil the flower section, instead I put the cup cake sticker there. That’s all for today folks. This project for me was like scrap booking, but creating framed art instead. It was a lot of fun! I wish you all a very Merry Christmas, and a happy, healthy New year. Your creativity is amazing! Great ideas! Well, the sky is a little clearer this morning in our area. Maybe that means Santa will have a good flight by the time he leaves the North Pole. I do hope you have a Merry Christmas and you and your family will enjoy all the magic of this glorious season. Merry Christmas and I look forward to what you will share in 2017. Blessings…..
Blessings to you as well Lynda! Merry Christmas to you and your family! Your blog is such a gift to people. Thanks for all you share. Look forward to 2017 and your new posts! Thank you Kathleen. I appreciate those kinds words so much. You all keep me motivated just as well. Merry Christmas! I truly enjoy getting your emails, love the ideas! Merry Christmas to you and yours. Thank you Beth! Merry Christmas to you as well. 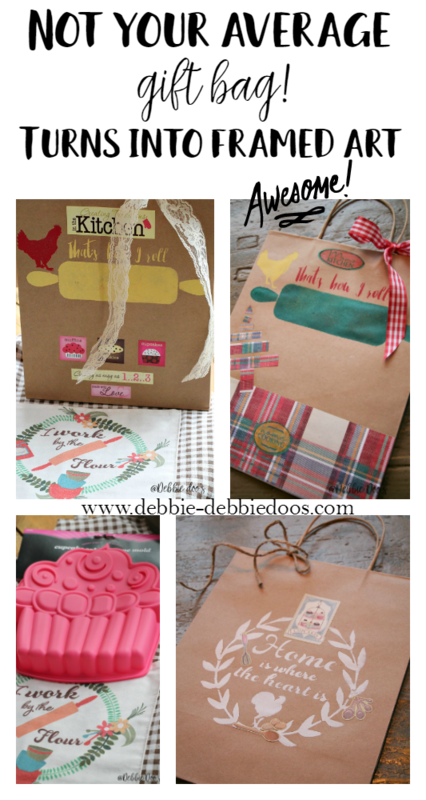 Love the way you decorated the bags…your stencils look great! !….Merry Christmas to you and your beautiful family Debbie!! !….enjoy them and my wishes for great 2017! !